With an objective to educate youths on the importance of skilling and further enhance their career Deshpande Educational Trust has launched one more remarkable skilling program “Elevate” on September 27th, 2018. Considering the known fact – ‘India has the world’s largest youth population’, the foundation has extended its initiatives in enabling the youth population of north Karnataka on basic employability skills to get career-oriented jobs, boost the confidence by self-learning & participatory method to lead a successful life. The trust also intends to connect the youths to better career opportunities in various job industries. Since there was a great demand from the student community and support from the college faculties of Government First Grade College (GFGC), Shiggaon the first batch of our Elevate program has already 30 students’ enrolment. In the coming days, the program will also be introduced in other colleges of Haveri and Gadag districts for the benefit of rural students. 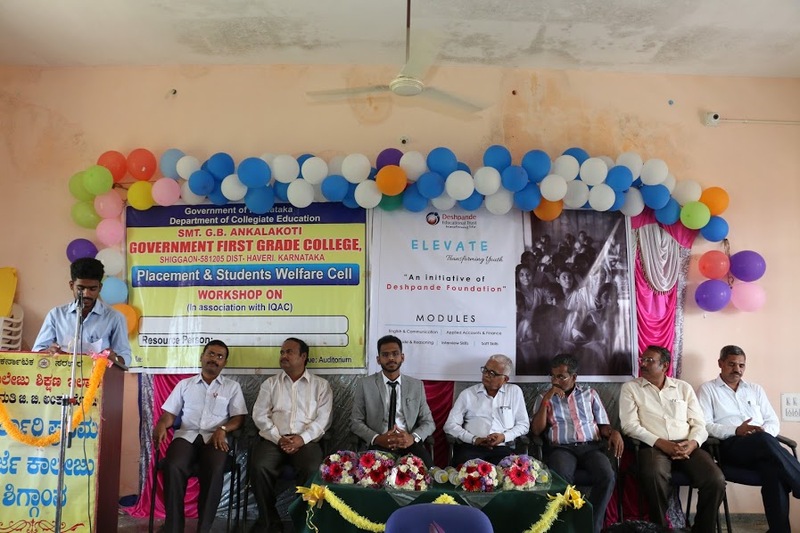 Prof. Malatesh B Naglapur, Placement Officer, Government First Grade College, Shiggaon; Sunil Kumar, Chief Technology Officer, Deshpande Foundation; Basavaraj G Arishinaguppi, Principal GFGC Shiggaon; Dr. Shivalingappa G Vibhuti, IQAC & NAAC coordinator, GFGC Shiggaon, Guranagouda N K, Deputy Director, DET and others were present at the inaugural program. GFGC girls students listening to the guests during the Elevate inaugural program.